The Presidents of the United States have always held a strong fascination for the American public. Some of these men were warriors, leading the nation's military against threats to the American wayof life; some were ambassadors, forging alliances with foreign nations; others were builders, building a powerful economy to secure the United States' place among the global superpowers. Regardless of their politics, few can deny that they have strength and authority as they performed their duties as President. Available exclusively from American Mint, this incredible set features fivegenuine Kennedy Half Dollars, each one layered in 24k gold and beautifully rendered with a full-color tribute our nation's greatest Presidents. 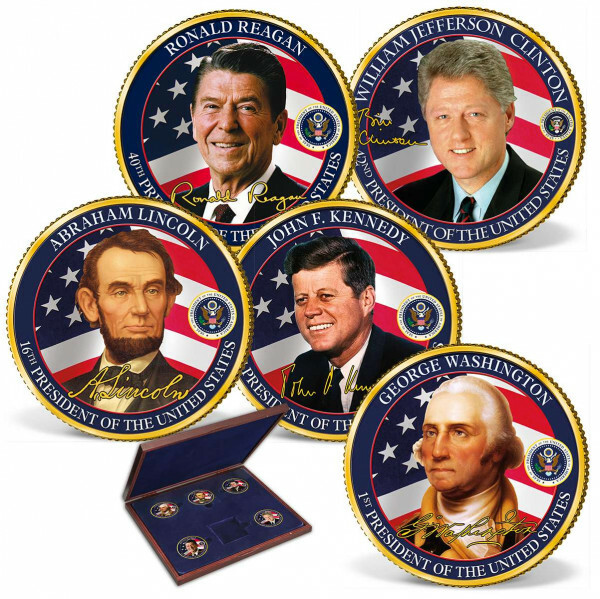 George Washington, Abraham Lincoln, John F. Kennedy, Ronald Reagan, and Bill Clinton are all celebrated in this limited-edition set. Presented in a handsome wood collector's box, this magnificent coin set is limited to only 9,999 complete collections worldwide.